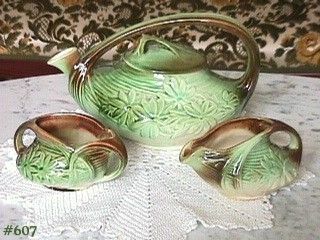 This listing has a beautiful McCoy tea service in the pretty green and brown Daisy pattern of 1942! The sugar has more brown color than the creamer -- production -- and is the case with many of McCoy's teapots, the lid does not fit snugly. All pieces are in excellent condition -- no chips, no dings, no cracks -- with minor age crazing. This is a beautiful McCoy tea set and is an excellent addition to any collection!